My birthday weekend went pretty much exactly as I had hoped. Chris and I had "breakfast" - it was 2:00 in the afternoon - at Taste of Crepes. Chris seemed to really enjoy it, which left me pleasantly surprised. After we'd finished our crepes, we browsed the shops on Penn Ave, including The Last Level where we finally purchased Rock Band 3 (which we still haven't gotten a chance to play). Then we went to see Insidious with Steve and Meghan. After that we went to Buca with my favorite loaf* of friends. When we had eaten our fill of roughly every food item on the menu, we headed to Kim and Dustin's house for punch and cake. 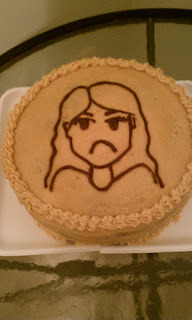 Check out the awesome cake Kim made for me - it's my twitter icon! On Sunday we slept in quite late, then spent the afternoon watching South Park on Netflix. We went over to mu parents' house for a delicious dinner of fried chicken, homemade macaroni and cheese, and asparagus. This was finished up with an oreo ice cream cake and tea. When we left, it was warm and raining and I got mu first whiff of Rain-Soaked Cement In The Summer, my favorite summertime scent. Even the weather gave me a birthday gift. *During dinner at Buca, we were discussing the weird names there are for groups of things (example - a murder of crows). Someone declared that there had to be a group of somethings that was called a loaf. Someone else decided that a group of friends should be called a loaf, and it just felt right. So I immediately started adding this phrase into my everyday terminology. You probably haven't heard of me, I'm pretty obscure.